Tales of the Flowers: Happy Platypus Day! It's the first Saturday of March, which means it's officially (un-officially) National Platypus Day! Back in 2011, the Disney Channel attempted to create a new holiday, honoring that furry little flatfoot, who'll never flinch from a fray. It's Perry! Perry the Platypus! 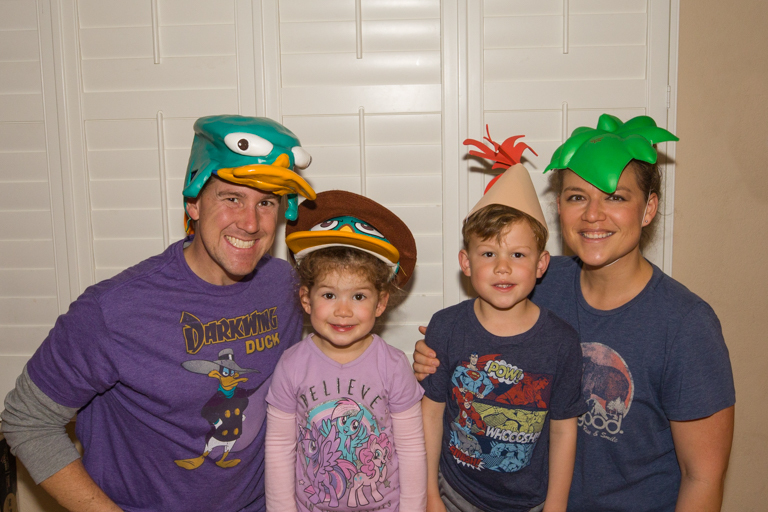 And even though Phineas and Ferb aren't showing any new episodes, and Platypus Day isn't celebrated officially anymore, that doesn't mean that we can't celebrate. This weekend we'll be watching re-runs of that amazing show where the boys are always building something and there's never a boring day. Time for the hat rundown. 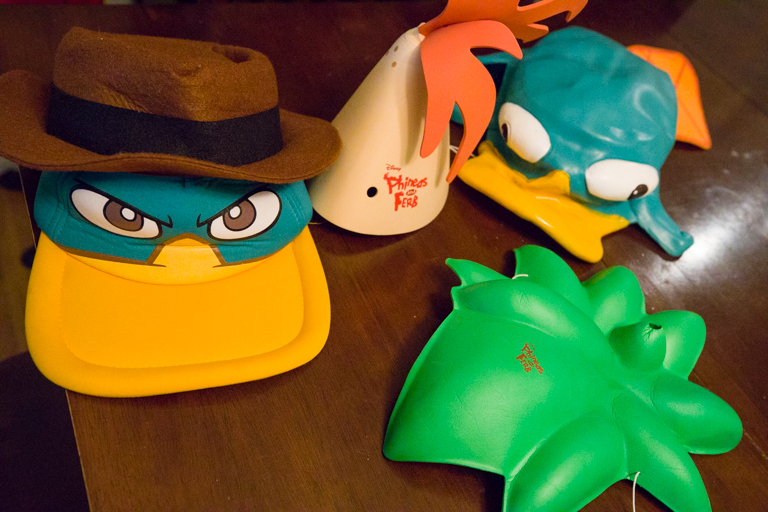 The Agent P hat on the left is straight from Disneyland. I'm happy that they still celebrate Perry there with plushes and beanies. 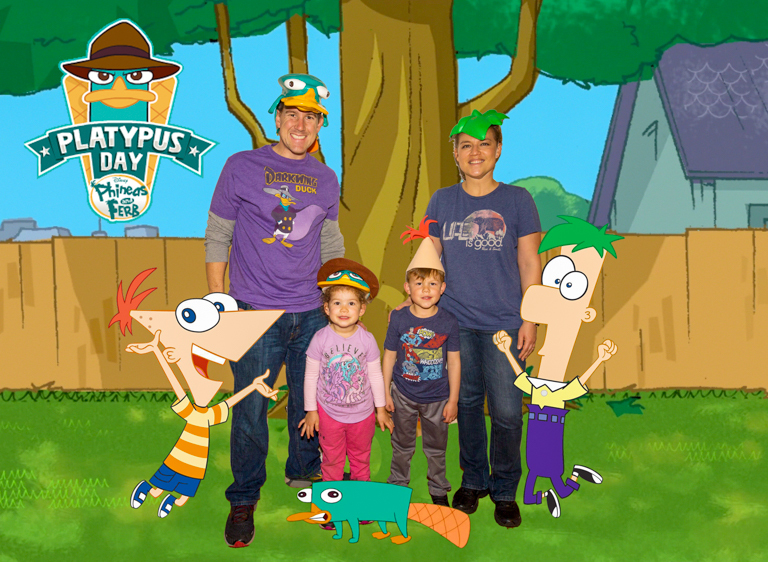 The two foam hats representing Phineas and Ferb are from the "Phineas and Ferb: The Best LIVE Tour Ever!" show that ran from 2011 to 2013. Similar to foam hats you can buy at Disney on Ice, these were hats you buy at the event. Lastly is the latex Perry hat that looked a lot better in the eBay photos than it does in person. But it's a good representation of Perry in his disguise at the Flynn-Fletcher family pet. However you choose to celebrate it, I hope you have a great Platypus Day! It's been on my calendar ever since you reminded me a few years ago! Did you celebrate this year? It was a very Perry day (platypuses don't do much, you know). With 3 out of 4 kids sick with the flu, we didn't celebrate quite as much as we normally do, but we watched some episodes. Very true! They don't really do much, do they? Sorry to hear you guys are sick. Hope you guys get well soon. So far Ian's not going into the full plan it, draw it, build it process, but I'm going to start teaching that kind of thing to him. I've got to figure out my next home project and get him involved.